C. Scribonius C.f. was one of the moneyers for the year 154 BC. He may be a son of the Praetor for 193 BC, C. Scribonius, and served as Praefectus Socium (Magistrate of the Allies) in 181 BC. Gens Scribonia is first men­tioned at the time of the second Punic war, but the first member of it who obtained the consulship was C. Scribonius Curio in b. c. 76. The principal families in the gens are those of Curio and Libo. 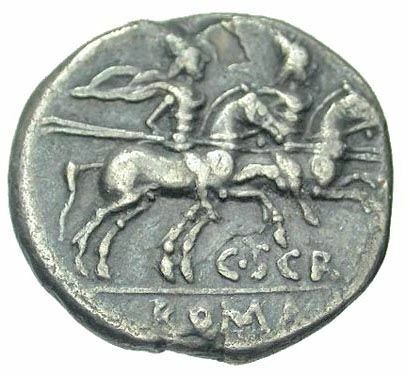 On coins Libo is the only cognomen which is found.